Last week Boise State shocked the football world by blowing a 24-7 halftime lead and falling 34-31 to Nevada. The Broncos promptly fell out of BCS contention. Auburn needed to overcome a massive 24-point deficit to keep the Tigers hopes alive, and even mighty Oregon struggled in the first half with Arizona, needing a second half rally to win 48-29. 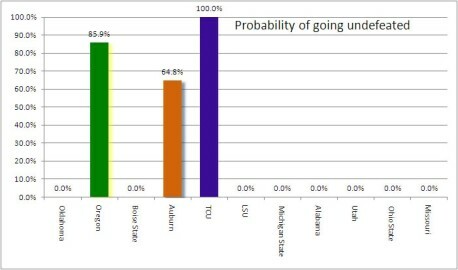 The graphs below shows, in order of the initial BCS rankings, each team’s likelihood of finishing undefeated. Let’s dig into each undefeated team in a little more detail and examine what has changed from week to week. No. 1 Auburn (0.9779, up from 0.9682) edged its way into the No. 1 BCS spot for the second time this season, as the Tigers were one of the beneficiaries of the Boise State loss. Auburn’s odds of going undefeated rise this week from 29 percent last week to 65 percent this week with just one opponent remaining: South Carolina. The Tigers 65 percent chance of winning is the result of their being favored by 5 points in Vegas. Current thinking by BCS gurus, however, suggests that a one-loss Auburn team would drop below an undefeated TCU team in the final BCS standings. For Auburn, the story remains unchanged since the season began: Win out and the Tigers will be playing for a national championship. To date, Auburn has defeated eight teams that will be bowl-eligible and five ranked in the current BCS standings: No. 22 Mississippi State 17-14, Clemson 27-24, No. 19 South Carolina 35-27, Kentucky 37-34, No. 7 Arkansas 65-43, No. 10 LSU 24-17, Georgia 49-31 and No. 16 Alabama 28-27. No. 2 Oregon‘s (0.9777, up from 0.9764) odds of going undefeated rose from 83 percent last week to 86 percent this week, with a rivalry game remaining against Oregon State. I wrote that after Oregon State managed a 36-7 win last weekend against Southern Cal, there may be some reason for optimism. After Notre Dame managed to beat Southern Cal and Oregon State was shutout 38-0 by Stanford, there is virtually no reason to be optimistic that the Ducks will lose. To date, Oregon has defeated three teams that will be bowl-eligible and two ranked in the current BCS standings: No. 4 Stanford 52-31, Washington 53-16 and No. 23 Arizona 48-29. No. 3 TCU (0.9167, up from 0.8995) took care of business last week against hapless New Mexico, putting up a season high 66 points in a game that saw Horned Frogs QB Andy Dalton leave the game with a minor injury. 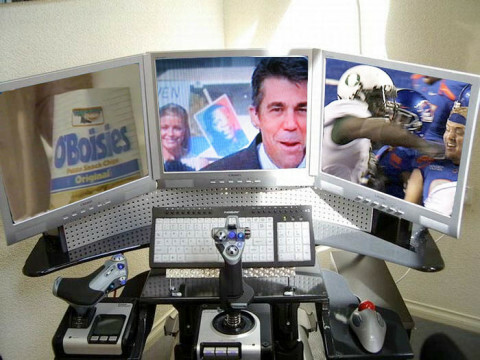 TCU will be watching Auburn and Oregon this week, hoping for a loss. If either team loses, TCU will be suiting up for the national championship game next month. To date, TCU has defeated six teams that will be bowl-eligible and one ranked in the current BCS standings: Baylor 45-10, SMU 41-24, BYU 31-3, Air Force 38-7, No. 20 Utah 47-7 and San Diego State 40-35. First a quick reminder what the chart below is showing: the probability of each of these unique outcomes occurring. The first bar shows that there is essentially a zero percent chance that no team goes undefeated (down from 0.1 percent last week). The odds of their being only two undefeated teams, most likely the easiest scenario for the BCS to handle has increased from 23 percent last week to 39 percent this week. 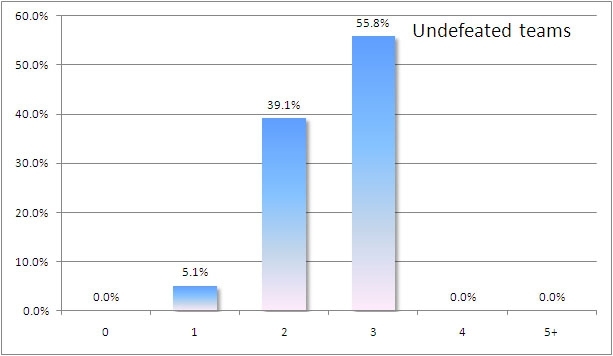 The most likely scenario is that three undefeated teams will remain (56 percent). The team with the most difficult remaining schedule is also the one least likely to make it through unscathed — your Auburn Tigers. Boise State’s loss last weekend forced voters to elevate TCU over the Broncos, where the two were previously sharing third-place votes. Although the loss makes it impossible that two nonautomatic qualifier teams could play each other for the national title, it makes the scenario of one team getting in more likely because of the jockeying of votes that occurred this week. Still, Auburn and Oregon each control their own destiny. For those interested, Covers.com is reporting that Auburn would be a 3-point underdog against Oregon. as tough a win as AU has ever had…. I wonder what the odds were when Bama was up 24-0. A road underdog down by four scores? That line would be OFF.